Climate change is putting the pinch on bumblebee habitats, says a study published today in the journal Science. 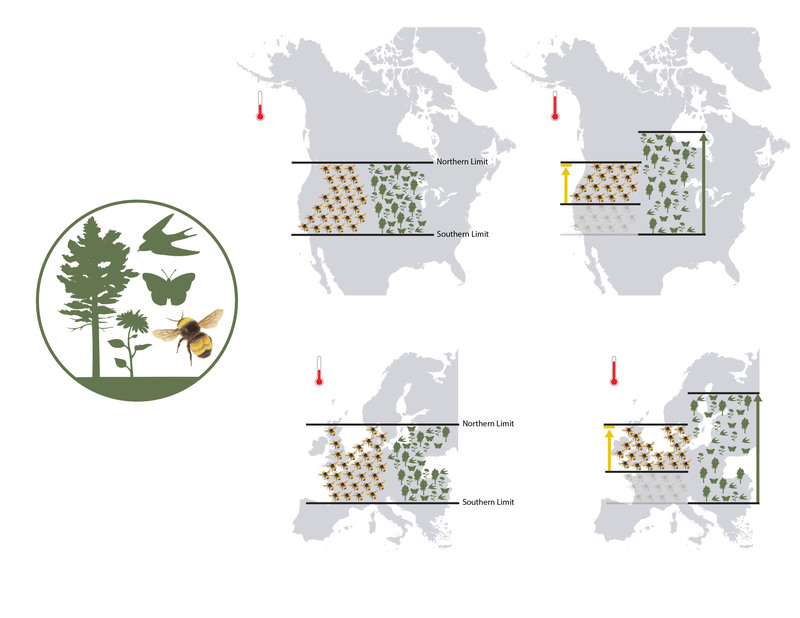 As atmospheric temperatures have risen, wild bumblebees in North America and Europe have not been extending the northern limits of their ranges to higher latitudes, as some other species have done. Meanwhile, higher temperatures are forcing bees to abandon the southern portions of their ranges, which have shifted north an average of 300 kilometers. "The net effect is a compression of the range and a loss of area in which a given species exists," Leif Richardson, a coauthor on the study and a postdoctoral researcher at the University of Vermont, told VICE News. "We have strong evidence presented in this paper to show that this is correlated with changes in temperatures — in climate — across the two continents." The researchers' data came from about 423,000 specimens of bumblebees from museums and other collections. Those samples provided them with key information: the species name, when it was collected, and where. The study included 67 different species of bumblebees, and incorporated data going back to the beginning of the twentieth century. "What's important about this, from the perspective of people, is that bees are very important components of our food system," Richardson said. "These wild, unmanaged bumblebee populations are in many cases the most important pollinators of agricultural crops." Those crops, he added, include foods like blueberries, soybeans, and tomatoes. Wild bumblebees should not be confused with honeybees, which live in colonies managed by people. Rich Hatfield, a biologist and expert on bumblebees at the Xerces Society for Invertebrate Conservation in Portland, Oregon, said he was surprised by the study's results. "Bumblebees are highly mobile animals that should be able to move northwards," he told VICE News. "If they're not able to move northwards, it means that what remains here is critical for their survival." The study, he added, is a good jumping off point for more research as well as citizen science initiatives that track the bees. Hatfield runs one called Bumble Bee Watch, a website that tracks the locations and species of bumblebees based on photos submitted by ordinary people. Nearly 50 species of bumblebees populate North America alone, and of those, between one-quarter and one-third are endangered to some extent, Hatfield said. Top on the list of hazards are pesticides and destruction of the bees' habitats. Another possible culprit is more surprising: some bumblebees are kept for commercial purposes to fertilize indoor greenhouses that grow products like tomatoes, which they do more effectively than honeybees. Hatfield said that these commercial bumblebees sometimes escape and spread pathogens to wild bumblebees. Jeremy Kerr, the study's lead author and a biology professor at the University of Ottawa, says he was also surprised by the results of their research. "We figured that bumblebee species would do what butterfly species have been doing, and what plant species have been doing, and that is that they would have been advancing north," Kerr told VICE News. "At the same time, [bumblebee] ranges appear to be rolling up from the south, just like a carpet," he said. "They're disappearing from these huge areas." Previous research has shown that other species' ranges have changed. A 1999 study in Nature found that some species of European butterflies had moved their ranges north. And a 2011 study in Science showed that some birds and even species of spiders and ground beetles had likewise shifted the northern edges of their ranges upwards in latitude. Kerr speculates that hot temperatures at the southern end of the bumblebees' ranges have been killing them, either directly or indirectly. At the northern end, he said that since bumblebee hives produce only a couple queens, when those queens set off to start new colonies, the odds are slim that she'll push northwards and successfully extend the range. "We think we may have discovered a new mechanism that helps us explain which species are going to be susceptible to climate change," Kerr added, with the caveat that, like all science, it needs to be confirmed by other researchers. That theory holds that the climatic conditions during which a species' ancestors evolved could determine how well the descendent species cope with rising temperatures. In this case, he points out that bumblebees evolved in a temperate climate, but butterflies, for comparison, did so in a tropical one. "And through evolutionary time," he said, "the daughter species have inherited their ancestors' relative tolerance to those warm conditions." He said that could be an explanation for the data they found for bumblebees at the bottom end of their ranges. "We think in the south, that's one of the reasons why they're having a really hard time," he said.